Dues are used to cover administrative costs of communicating with our members, partly subsidize reunion activities, and for the maintenance & growth of our organization. Memberships coincide with our fiscal year August 1st - July 31st and are renewable annually. Ceramic coffee mug. 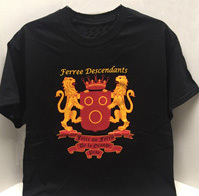 Ferree Descendants decal on both front and back. Choice of black or white. 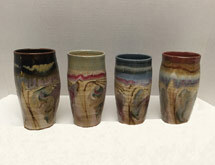 16 ounce mug handcrafted by Ferree descendant, Mike Ferree, a professional artist renowned for his work in the field of ceramics. 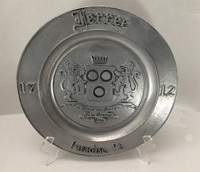 16 ounce goblet handcrafted by Ferree descendant, Mike Ferree, a professional artist renowned for his work in the field of ceramics. 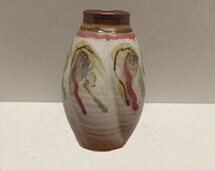 16 ounce vase handcrafted by Ferree descendant, Mike Ferree, a professional artist renowned for his work in the field of ceramics. 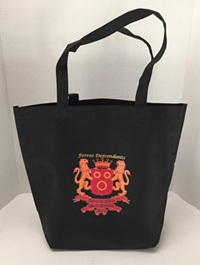 High quality cotton with silk screen print of Ferree family crest. Available in tan only. Available in size Medium, Large, Extra Large, and Extra Extra Large. High quality cotton with silk screen print of Ferree family crest. Available in white only. Medium size only. 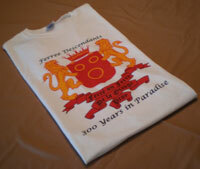 High quality cotton with silk screen print of Ferree family crest. Available in black only in sizes S, M, L, XL, XXL, XXXL. Price varies with size. 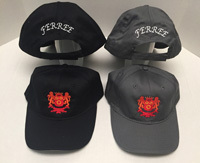 A high quality personalized cap embroidered with the Ferree crest on the front and Ferree embroidered on the back. Available in black or gray. Written by Emory Schuyler Ferree, this book is an informal collection of material relating to the story of the Ferree family from their beginnings in France to their life in Paradise. 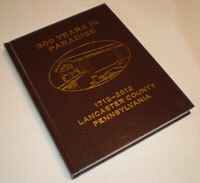 Published in 2012 by the Paradise Township 300th Anniversary Committee. This book is a recorded history of the events and people of the past that made Paradise what it is today. 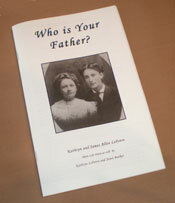 A booklet about the life story of Kathryn and James Allen LeFevre written by Kathryn LeFevre and Janet Booker. This is a 8X10 print of the Reformed Pelican Church of Billigheim, Germany. On March 10, 1708, our ancestors were given a certificate of departure from the Reformed Church of Billigheim. It is assumed that Daniel was dead at the time of their departure because he is not listed with the rest of the family. The artist is Evangeline Ferree from Boise, Idaho. This is a 8X10 print of St. Martin's Church located in Steinweiler, Germany. 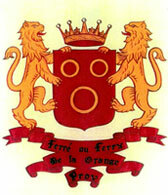 The Ferree family bought land, cottages, and goods in Steinweiler in 1681 and 1683. This small village of St. Martin's was shared by the Protestants and Catholics during this period of time. The artist is Evangeline Ferree from Boise, Idaho. 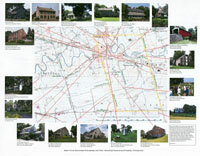 This unique map shows the locations and photos of Ferree related homesteads and historical sites in the Paradise area with a brief history of each. Approximate size is 17x22 in. and suitable for framing. 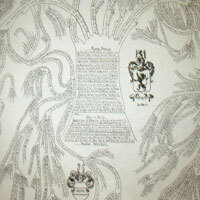 Compiled by Jesse Witmer Landis, a Ferree descendant, this tree chart records the history of the Ferree family from the marriage of Marie & Daniel Ferree until the 1930s. Approximate size is 3x4 ft. There will be a 6% sales tax for Pennsylvania residents. For packages to be sent outside the USA, buyers will be contacted when shipping costs are known.